I had to Apologize to My Students- Their Reaction Left Me in Tears! 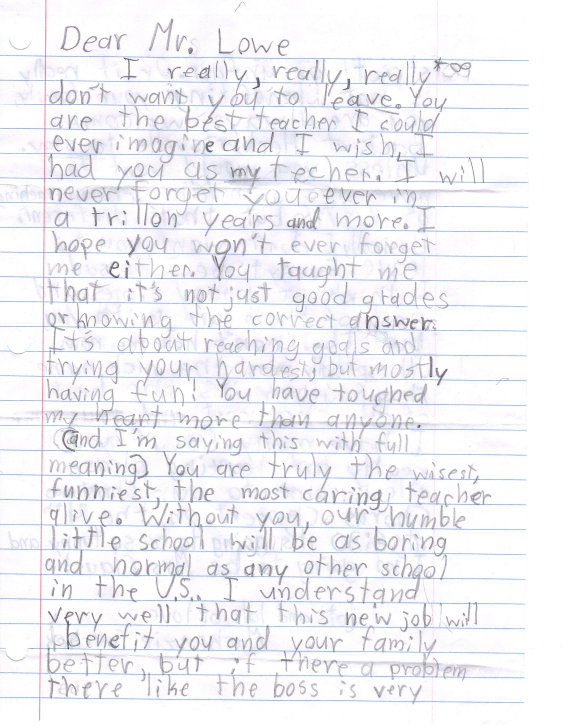 Portion of a letter given to me from a student in a partner class after learning I was leaving. Truly humbling to learn you inspire students who are not even in your class. Almost 2 years ago, due to circumstances in education, family, and life, I made a decision to leave teaching, to walk away from my classroom. Two weeks prior, I had to endure the task of informing my students of my decision. It’s ironic how selfish one can be in a profession that is filled with the rewards of giving. My profession, for the first time in 15 years, started feeling like a job in the weeks leading up. I had lost focus, and with it, lost the love and passion from which I thrived. It had become all about me: the hatred building up inside of me, the decision I had to make, the failure I was going to be in my students eyes. I hated that society didn’t value my profession. I hated that the Federal and State governments tried to label my students as Proficient or Non-proficient. I hated that my performance was going to be judged based upon these tests. I hated that I was a data collecting machine. I hated Summative and Formative testing. I hated those who spoke of pedagogy and rigor. I hated that my district didn’t value technology. I hated that I was reprimanded for the tangle of electrical cords when my request for replacement batteries for laptops was denied. I hated that increasing contributions to my benefits package guaranteed a continued pay cut every year. I hated that a yearly pay cut meant I could not provide for my family and left me no choice. I hated having to make that decision. I hated that I had to look my students in the eye and tell them “I am sorry, I failed you as your teacher.” In my search to excuse my feelings of failure, I had lost sight of the only opinion that truly mattered. In those weeks, I truly did fail my students, but my students never failed me. On that dreaded day of revelation, about 30 minutes into my tear filled explanation of my decision to leave the classroom, one of my students stopped me. She stated through her own tears, “Why do you keep saying Sorry? You did nothing wrong.” She continued by clarifying in 3 minutes what I had tried to say in 30. She informed all that putting my 3 kids ahead of them as students was nothing to apologize about. She proceeded to lecture the class and myself that even though we only had 2 more weeks together, we should be thankful for the last 4 months of being Mr. Lowe‘s class. With the conviction of a true leader, she requested everyone to not discuss this anymore and make the most of our last 2 weeks together. She ended by telling me that I was more than just a teacher to this class. She believed in everything I said including forever being one of Mr. Lowe’s kids, and my being out of the classroom was not going to change that! There have been plenty of times students had to correct me and there have been plenty of times students have inspired me, but this was just the beginning of the most inspiring 2 weeks I had ever experienced. It is inspiring to see your students put into action everything that you preach about as a teacher especially when you had just dropped a bombshell on them. “Leave your troubles at the door.” “When you enter this classroom, you enter with a promise to always do your best, even when things are at their worst.” “Are you proud of your work?” Did I ever mention these were 4th Graders?